Prune: The general rule of thumb is to prune shrubs shortly after they are done blooming. 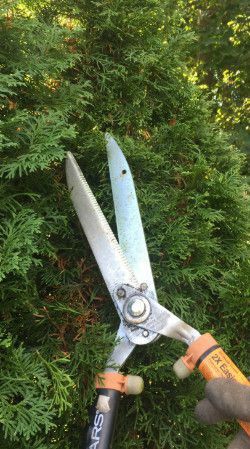 However, I like to prune my evergreens lightly before the winter to prevent them from being so large. This will help prevent the upcoming snow and ice from weighing down on their limbs and possibly breaking. You probably have noticed tree cutting services in the area cleaning up trees that are growing close to power lines. This is done for the same reason; to prevent tree limbs from sagging or breaking over top of power lines. Common plants such as hosta, daylilies, and many ornamental grasses should also be cut back close to the ground so that new growth in the spring can flourish. Please note: be careful not to prune any plant back that is creating buds this fall for flowers that will develop next year (i.e. hydrangeas). Protect: A few years back, we noticed wide spread damage to evergreens because of a long and cold winter. Freezing temperatures and unforgiving winds caused evergreens to dry out so much so that the foliage died! The roots may have survived, but the leaf structure was gone and took awhile to rebuild. Some of these plants may still be recovering from the winter of 2014-15. Prevent this damage from occurring by spraying your plants with a protectant, such as wilt-stop, or covering them with burlap to insulate them from the wind. Mow lawns shorter in the fall. This will make it easier to rake the lawn free of leaves and debris. In conjunction with thoroughly raking leaves, mowing your lawn to a shorter height will prevent snow mold from forming in grass that never has a chance to dry out. Do this in a progression by eventually tapering down to 2″ in height for the final cut of the year.